If you’ve read my blog over this inaugural month, I hope you’ve noticed that I like looking at historical numbers. My book, The Late Round Quarterback, deciphers past numbers in order to provide a well-developed fantasy football strategy that can help both pre- and post-draft. It’s not all that fair to look at the previous season and assume the same outcomes will occur again. And it’s not reasonable to look at historical seasons by players and conclude that it’s the way a player will perform from here on out. It’s why data is so important when looking at fantasy sports. It can help value a position or player tremendously. And, as I’ve said many times before, value is the most important aspect of fake football. We need to look at history to help look at trends and prepare for a draft. If we didn’t do any analysis, we’d assume the NFL would always remain constant. We all know that’s not true. I’ve picked out 5 of my favorite facts that may help sway some of your draft decisions. Don’t assume all of these facts will hold true after this season, but if history is any indication, they can help make sound draft decisions. 1. Since 2005, only two running backs have cracked the top-10 while receiving less than 200 carries. Darren Sproles did it last year, and Maurice Jones-Drew did it in 2006 and 2008. Something more interesting? Neither of them ranked higher than 8 at the position. Many believe that starting running backs can be drafted in the 5th or 6th rounds because the NFL is moving to this pass-first league, and running backs are less important to fake football. The fact is, just 19 running backs received 200-plus carries last year. The majority of those players will be gone by Round 5. When you look at those middle rounds, you see players like James Starks, Roy Helu, Willis McGahee, Isaac Redman, BenJarvus Green-Ellis and Donald Brown. While each of those players have a possibility of receiving 200 carries in 2011, each of those players has some sort of competition. And of course we consistently see middle-round running backs finishing at the top at season’s end. But picking them out is very risky, and realistically, the same can be said for any position. If you don’t believe me, check out my article on quarterback and running back consistencies. 2. Rob Gronkowski was the first tight end to score over 200 fantasy points. This has happened 42 times at wide receiver since 2000. Now, I’m not comparing tight ends to wide receivers. The only time you should do that is when you’ve got a TE/WR flex spot in your lineup. What I’m showing here is that, when more points are scored at a receiving position, there is more variation in points between the elite and the rest of the pack. What do I mean by that? Well, historically, the 20th ranked receiver has scored around 130 to 140 fantasy points per season. The 10th ranked tight end has scored 90 to 110 (this baseline number has been increasing over the last few years). Therefore, the worst starter in a standard 10-team fantasy league at tight end is scoring just 30 or 40 points less than the worst receiver. Now, in order for the top tight end to be more valuable than the top receiver in a given year (using the basics of VBD), the receiver would have to outscore the tight end by 30 or 40 points. Considering last year was the first time multiple receivers didn’t have better value than a tight end, do you want to take a shot on repeating history? I’ve let it be known how I feel about Gronk and Graham. It’s your choice, and there’s valid argument for getting Gronkowski or Graham in the second round. I just need to see it happen one more year to feel confident. 3. There have been just three rookie wide receivers to crack the top-15 since 2006. Those of you who are banking on a rookie receiver to be startable in a 10-team league – think again. Only Marques Colston, Mike Williams and AJ Green have been top-15 receivers during their rookie campaigns. If you want a percentage, a little over 3% of top-15 receivers since 2006 have been rookies. It’s not to say that it can’t happen, but history tells us that it’s not likely in 2012. Stick with late-round rookie running backs. 4. Last year was the first time more than two quarterbacks outscored the worst starter by 100 or more points. When we look at how the top quarterbacks perform and compare them to the worst starter in a league (the 10th starter in a 10-team league), there’s not usually a massive discrepancy. Running backs have historically outperformed their peers by a much greater margin than quarterbacks. 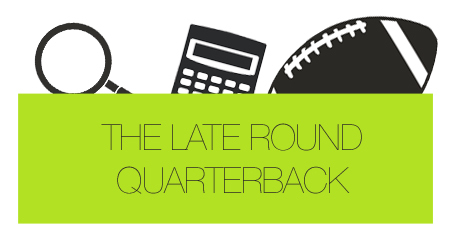 This is, at a high-level, the concept and theory of The Late Round Quarterback. We don’t always see a 100-plus-point differential from the best quarterback to worst starting quarterback. In 2009, for instance, Aaron Rodgers, the top quarterback, scored 96 more points than the 10th ranked Eli Manning. Last season, however, we saw four quarterbacks outscore the worst starter in a 10-team league by 100 or more points. It was the first time this had happened. In the past, we’d seen it occur with two quarterbacks in a seaon, but never three, and definitely never four. Many people are jumping on the quarterback bandwagon because of this. But before you do that – read my book. It will sway your opinion on an early-round one. 5. Since 2006, an average of 4 wide receiver duos have finished in the top-24 per season. Gone are the days of multiple elite receivers. Nowadays, the spread offense is king. And with that, receivers that are number 2 and 3 on a team’s depth chart are becoming more relevant to fantasy football. We would think that elite receivers are catching more passes, but actually, the opposite is true. From 2004 to 2007, 43 receivers caught 85 or more passes in a single season. From 2008 to 2011, this number has dropped to 29. It’s because quarterbacks are lining up in the shotgun formation more than ever, and they’re targeting multiple receivers. This statistic just goes to show that you can, and should, look at receivers that are deeper on depth charts before jumping on a number one guy on a bad team.